Friendly volunteers welcome visitors to the Tehachapi Depot Railroad Museum in Downtown Tehachapi. Wish you were here! 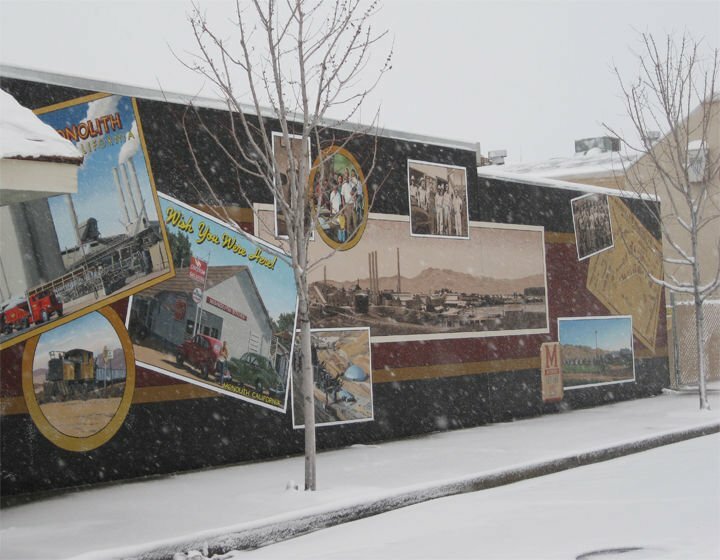 Tehachapi's Monolith mural on a snowy day, March 18, 2012. The T-hacha-P Brand panels were created from photographs by Art Mortimer. The USPS Air Mail was created by muralist Mark Pestana. The Centennial Panels celebrating the city of Tehachapi were created by artist Colleen Mitchell-Veyna. 1915 Street Dance was created by muralist Phil Slagter. The Legend of Avelino Martinez was created by muralist Patti Doolittle. The Legend of Avelino Martinez” was created by muralist Patti Doolittle. Red Front Blacksmith Shop was created by muralist Lynn Bennett. People of the Mountains: The Nuwa Tribe was created by muralist Colleen Mitchell-Veyna. The BeeKay Mural was created by muralist Colleen Mitchell-Veyna. The Cement Plant at Monolith mural was created from photographs by Art Mortimer. There also are a large number of murals depicting historical and cultural facets of Tehachapi along with helpful markers identifying points of interest. This structure was built in 1932 as the Kern County Branch Library. When a new library was constructed in 1981, the county gave the old building to the City of Tehachapi, with the stipulation that it be used as a public building. In 1982, the city leased it to the Tehachapi Heritage League to be used as a museum. The Errea family occupied this dwelling for 75 years. The structure was built by a doctor in “Old Town” (or “Tehichipa”) 4 miles west of Tehachapi, between 1870-75. It was moved to this location on log rollers in about 1900. It is the only surviving structure from the Tehichipa settlement. The Errea house was listed on the National Register of Historic Places on July 29, 1997. The original building, built by Jean Capdeville, was used as a rooming house. It was sold to Drs. Madge and Harold Schlotthauer in 1934 and was used as the hospital until the 1952 earthquake. Although badly damaged, no lives were lost in the hospital. The large trees planted by the Capdevilles remain. These two houses were constructed in the 1890s. One structure was built by R.D. Williamson, the other by Fred Boden. Built by Joe Gallinger in 1880, it was purchased in 1924 by Jim and Lucinda Wiggins Brite. In 1944, the Davis family purchased the house. It was customary in those days to drive sheep and cattle along Curry Street to the railroad stockyard. The present building was constructed in 1936, as the second St. Malachy’s Church. In the early 1980s, the structure was sold to the newly formed Sierra National Bank, which in turn was acquired by the Bank of the Sierra in May 2000. Built as the Odd Fellows Hall in the early 1930s, it was later used as a movie theater, dance hall and labor union hall. It was once owned by St. Malachy’s Church and was used as a church hall (1949-53). The structure survived the 1952 earthquake intact, and then housed the Red Cross, telephone company, and a department store, among other temporarily displaced businesses. It was then sold to become the Santa Fe Hotel, and later became a private residence (known as the Talmarc Building). It is currently known as the Door of Hope Building, operated by the Family Life Pregnancy Center. The Tehachapi Depot building was originally constructed in 1876 and replaced in 1904 after a fire. The depot is a rare Southern Pacific Combination Type 23 building. 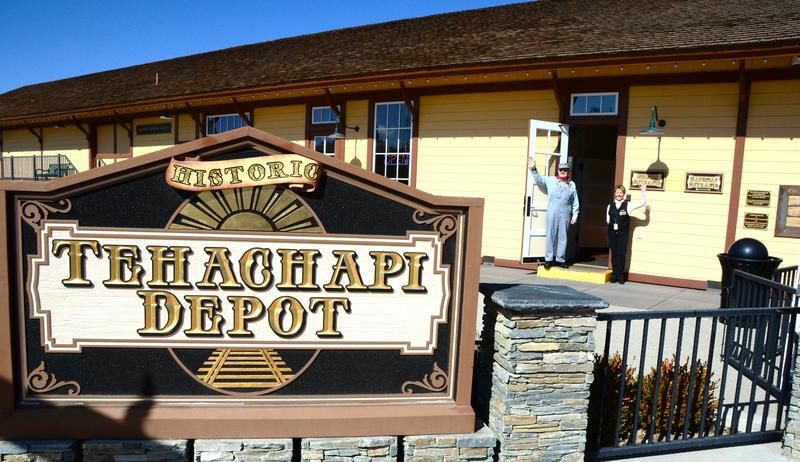 Through the auspices of the Tehachapi Heritage League, the depot was listed on the National Register of Historic Places in 1999. In 2008, the depot burned once again and was totally reconstructed in 2009, now serving as the Tehachapi Depot Railroad Museum. Although no longer a railroad stop, it was one of the most active rural and agricultural stations in the state during World War II. The Richfield Service Station was built here in 1921 by Jack and Ted Leiva, who operated the station and adjoining cabins for travelers for more than 50 years. It was named the Bartlett Richfield Station due to the many Bartlett Pear trees being planted in the area at that time. Earlier, this was the site of the first town dump. This was the first house constructed in Tehachapi, built in 1877 by Fred Boden. It was occupied from 1895 to 1940 by Mr. and Mrs. T.P. Sullivan. Sullivan was the Southern Pacific Roadmaster and was elected to Tehachapi’s first Board of Trustees in 1909. It was designated a local landmark by the Tehachapi City Council. The house takes its name from the Jose Muro family, which lived in the house for many years from before World War II. In 1930, the old City Hall was constructed just south of here at the corner of F Street and Robinson. Almost identical to the current Tehachapi Museum building, the old City Hall has been extensively modified. These reinforced concrete-walled buildings withstood the 1952 earthquake, without damage. The St. Vincent De Paul thrift shop now occupies the Bandhauer Market building, which was later the Town and Country Market. Just to the north, between this building and the BeeKay Theatre, was the Tehachapi Food Lockers and the Lottie Lee Shop. These two shops were later torn down to make space for a parking lot for the Bandhauer Market. This building was built as a motion picture theater. It was constructed of thick, reinforced concrete, and survived the 1952 earthquake. It was remodeled as an indoor mall and later sold to the Moose Lodge. A fire in 1994 destroyed all but the shell. This building is now owned by the City of Tehachapi and has been lovingly restored. The mural on the south side of the building is Tehachapi's latest mural and depicts people waiting for the theater to open. Site of Early Historic Buildings: The current building, which was built for the post office, replaced two older houses. Across the alley, there was once a small, tin building that housed fire fighting equipment, including a hand-drawn cart with hoses. That building can now be seen at the northeast corner of the Errea House garden (Walking Tour stop No. 2). August Weferling House: Located on the northeast corner of D and Green streets, this house was built in 1880 by August Weferling. The redwood tree in the front was planted the day he married his second wife, in 1905. McFarland House & Late 1880s House: McFarland House, located on the northwest corner of D and Green streets, this house was built in the late 1880s by the McFarland family, which operated a sawmill and box factory in Tehachapi, circa 1890. Across the street, a late 1880s house was located on the southwest corner of D and Green streets. B.M. Denison House & 1880s House: Located on the northeast corner of D and Curry streets, this house was built in 1898 by B.M. Dennison. The house was constructed entirely from cedar wood. Denison planted the first commercial Bartlett Pear orchard along Curry Street. Across the street was the 1880s House, located on the southeast corner of D and Curry streets, this house was built in the late 1880s. “People of the Mountains: The Nüwa Tribe” Painted by Colleen Mitchell-Veyna in 2004. In this village scene from before contact with Europeans, women weave baskets and grind foodstuffs in bedrock mortars. Children play games, as the men make tools and weave rabbit pelt blankets. The border shows more recent members and elders of the tribe, and baskets for which the local Indians were known. The background includes local pictographs, a natural lake and the natural vegetation still visible in the area, such as cattails and rushes. The domed huts are called kahni, which means "house" in the Kawaiisu or Nüwa language. “Red Front Blacksmith Shop” Painted by Lynn Bennett in 2006. The original Red Front Blacksmith Shop was located directly across the street from this mural. The workers pictured represent many local ranching families. The images in the ovals next to the buildings show scenes from Tehachapi’s ranching history. The outside ovals show working blacksmiths in their shops. All images were taken from old photographs. A few of the well-known local cattle brands and the names of the ranchers are shown in the box. “1915 Street Dance” Painted by Phil Slagter in 2004. A street dance held in 1915 commemorated the first electric streetlights installed in Tehachapi. The site of the dance was the corner of Green and F streets. The building there housed the Masonic Lodge and the Post Office in 1915, and you see the type of streetlight actually installed in 1915. Faces of current local residents, and those from the history of Tehachapi, were chosen to incorporate into the scene. The faces represent five former mayors, other old-time residents, as well as current residents, one child and a dog. The fire hydrant with a straw hat tossed casually on top is from the original photo. “The Legend of Avelino Martinez” Painted by Patti Doolittle in 2007. It depicts a cowboy who worked for a famous outlaw. Martinez came from Mexico with a group of drovers as a 13-year-old. Of Mexican, Native American and Chinese descent, he stood 4 feet, 4 inches tall. He worked as a horse groomer for legendary outlaw Joaquin Murrieta until 1853 when Murrieta was captured. He then worked at Ranch El Tejon until 1920 before moving to Cummings Ranch in Tehachapi until his death in 1936, reportedly at the age of 112. “USPS Air Mail” Painted by Mark Pestana, noted test pilot and Tehachapi resident, and completed in 2007. It is located on the front of the Hitching Post Theater and commemorates the building as the site of the original Tehachapi Post Office, constructed after the 1952 earthquake. An original architectural feature of the wall is the inset relief of an eagle, a sculptural element that is incorporated into the envelope. “Cement Plant at Monolith” The Monolith Mural was designed and painted to display the importance of the cement plant and the township of Monolith to the history of Tehachapi. It was created based on vintage photographs by Art Mortimer and celebrated the 100th anniversary of the plant, where production began in 1908 by the City of Los Angeles for cement that was used in building the Los Angeles Aqueduct. 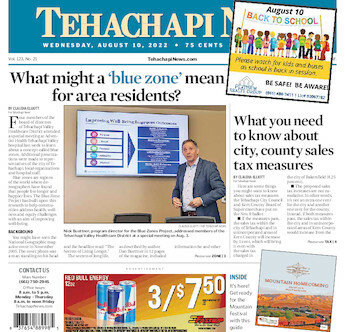 “T-Hacha-P Brand” Logo originally designed by Art Mortimer, painted by Tehachapi artists in 2005. The “T-Hacha-P” logo was taken from an early fruit crate label. The steam powered combine shown is followed by a horse-drawn water wagon, with Tehachapi Peak in the background. Jake Jacobsen, a former mayor and civic leader, along with his brother Rolf, built this seed-packing shed. The funnel still seen on the roof of the building, directed seeds into a hopper, which you can see inside the building. In the past, Tehachapi has seen the production of seeds for many diverse crops. “Centennial Panels” To celebrate the City of Tehachapi's centennial, the panels were created in 2009 by artist Colleen Mitchell Veyna and volunteer assistants. Over the course of just a few days, the group transformed three large panels in a concrete block wall on the north side of Tehachapi Boulevard into a gallery of Tehachapi's past and present. “BeeKay Mural” The latest of Tehachapi's murals, it was completed in 2011 and is on the side of the BeeKay Theater adjacent to the newly developed Centennial Plaza. The mural was more than eight years in the planning and celebrates the history of the theater originally built by Frank Baumgart and Lou Kanstein, the name coming from their initials. The artist was Colleen Mitchell Veyna. The people waiting in line to buy tickets are all locals whose families chose to honor them by including them in the mural. Those in line come from different eras but, for the sake of uniformity, are all depicted in 1940s-style clothing.